to our Internet Explorer users (our Firefox Toolbar users have been enjoying it already for the last few weeks). You can quickly access your most viewed sites, recently closed tabs and bookmarked pages — all from this new tab page. Editing your most visited sites is easy, and all this data remains locally in your browser, meaning none of your most viewed sites or recently closed pages are sent back to Google. Those who prefer new tabs to open a blank page or a website can do so in the Internet Explorer or Toolbar settings menus. So, give the latest toolbar a shot — it's available in 40 languages — and don't forget to let us know what you think. Update on 3/24: Google Toolbar 6 is now out of beta. The Toolbar Team has always been focused on improving your web experience. We started with the goal of making search more accessible, and a couple of iterations led to improvements like search suggestions, Google Bookmarks, Autofill, and Custom Buttons and gadgets. Now we're bringing the focus back to our core areas of search and navigation. First of all, in today's Toolbar 6 launch for Internet Explorer we're introducing the Quick Search Box (QSB) feature that provides search functionality outside of the browser. Just click on the Google logo in the taskbar to trigger it (or use the Ctrl+Space shortcut for quicker access). As you type, it will provide search and website suggestions, relevant bookmarks, and even allow you to launch applications directly from the search box. 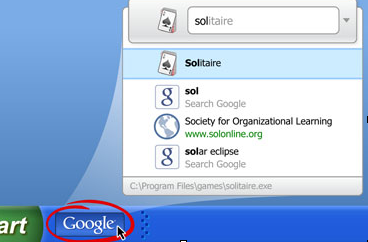 Try typing "solitaire" to see the application launcher in action. And here's the best part: as you use the QSB, it'll customize itself to your usage pattern, so over time you have to type fewer characters to navigate to your favorite sites and applications. In addition, we're building on our existing suggest functionality in the Toolbar search box by bringing elements from our search results page directly into the toolbar. We're experimenting with displaying high-quality website suggestions and sponsored links as you type your query. Clicking on these will take you directly to the website (try typing "cnn" in the toolbar to see an example). Going forward, we'll continue to explore new ideas and optimize the search box to give you the best experience possible. Lastly, we wanted to bring the new tab page to our Internet Explorer users (our Firefox Toolbar users have been enjoying it already for the last few weeks). You can quickly access your most viewed sites, recently closed tabs and bookmarked pages — all from this new tab page. Editing your most visited sites is easy, and all this data remains locally in your browser, meaning none of your most viewed sites or recently closed pages are sent back to Google. Those who prefer new tabs to open a blank page or a website can do so in the Internet Explorer or Toolbar settings menus.